Yeah, yeah, I know, it’s been awhile. Mikey hasn’t stopped reminding me. It’s mostly Mikey’s fault I haven’t been around in awhile. 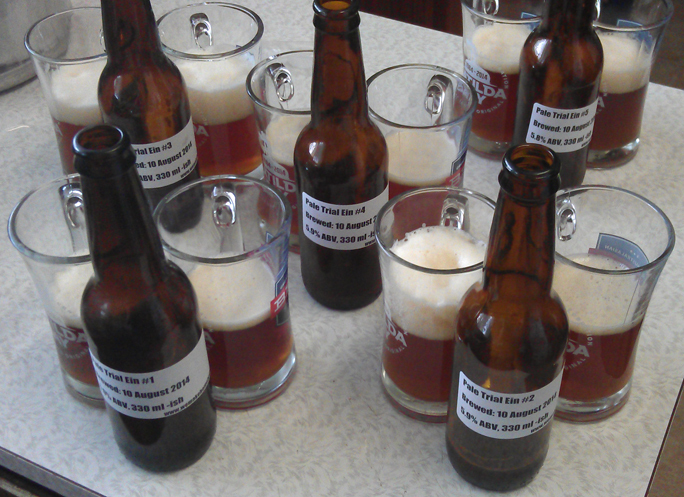 As Mikey mentioned, brewing slowed down a bit over the summer, so there wasn’t much to write up. Although I pushed through the heat and still did a couple a brews, giving Mikey an opportunity to write reviews for things like the Red Dog Pale Ale 2, since Mikey was slack, I had nothing to review. Unfortunately I just got out of the habit… because of Mikey. 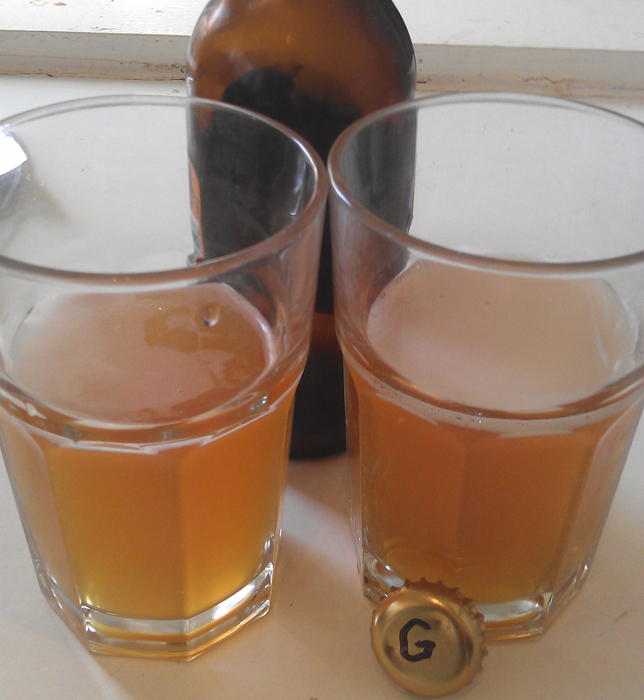 Anyway, nearly a year ago I mixed some apple juice with some liquid malt; I called it a malted cider, some call it a graft. Either way it’s pretty tasty. The recipe was about the same as last time, just with different apples this time. Last time I got some organic apples, this time it was just a whole bunch of Pink Lady apples, they worked out pretty well. 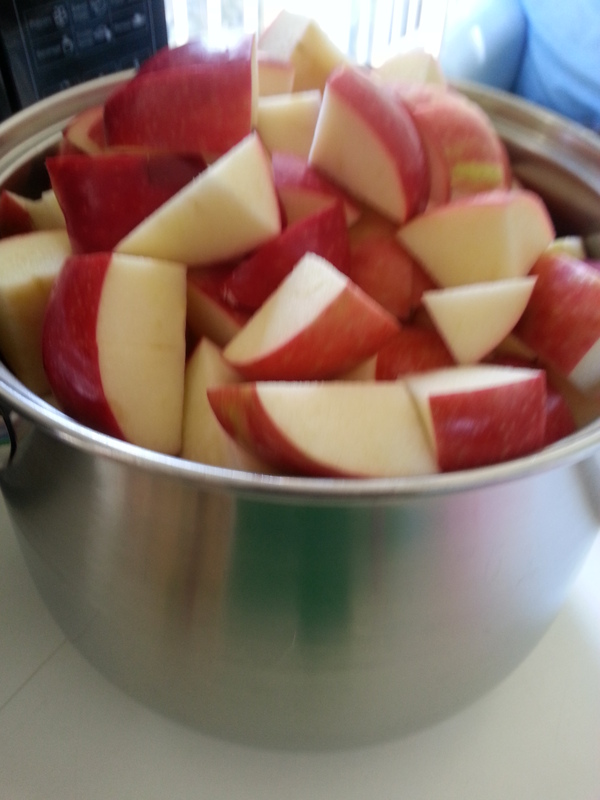 First, all the apples were chopped and let to sit for a few hours. This just softened them up a tiny bit and I’ve been told this gives a slightly sweeter cider (otherwise it’s way too dry). Next, we juiced all the apples, as would be expected! 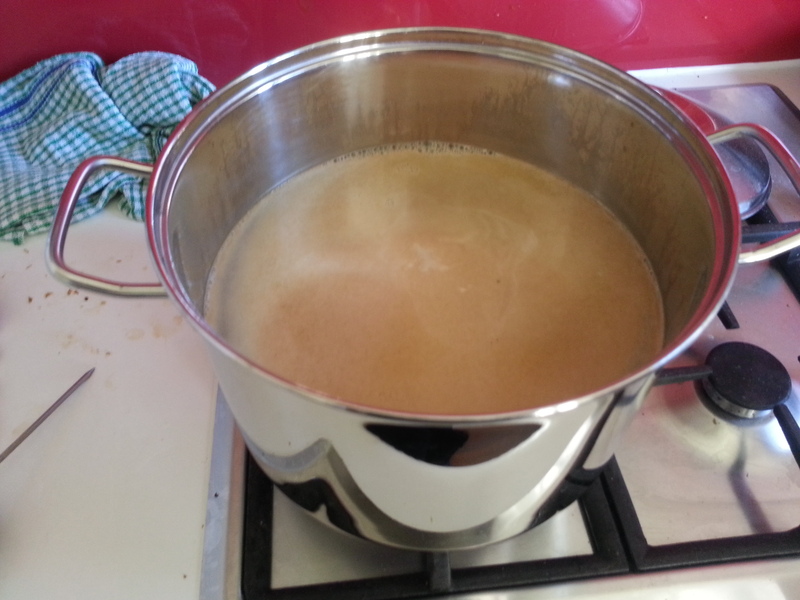 In the pot and since there is a bit of froth (and eventual evaporation), it’s hard to tell how much juice there is. So we didn’t add the malt right away. We gave the juice a 10-15 minute boil to kill any nasties. This went into the fermenter. 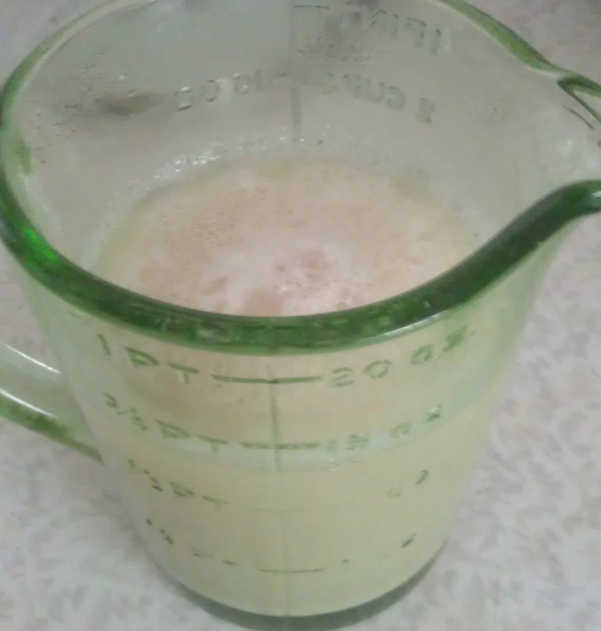 Golden light liquid malt was then added at a ratio of half a cup per litre of juice. We then topped the fermtenter up with cold water at a ratio of one litre of water to one litre of juice. Pitch some wine yeast and done! It’s a pretty simple recipe! All the chopping and juicing of the apples took a fair while. It also made one hell of a mess but it was a bit of fun. In the end we got a OSG of 1.053, which we were pretty happy about! Considering we’ll probably get a pretty low final gravity, since the fructose in the apples will ferment almost completely, this cider should have some kick! 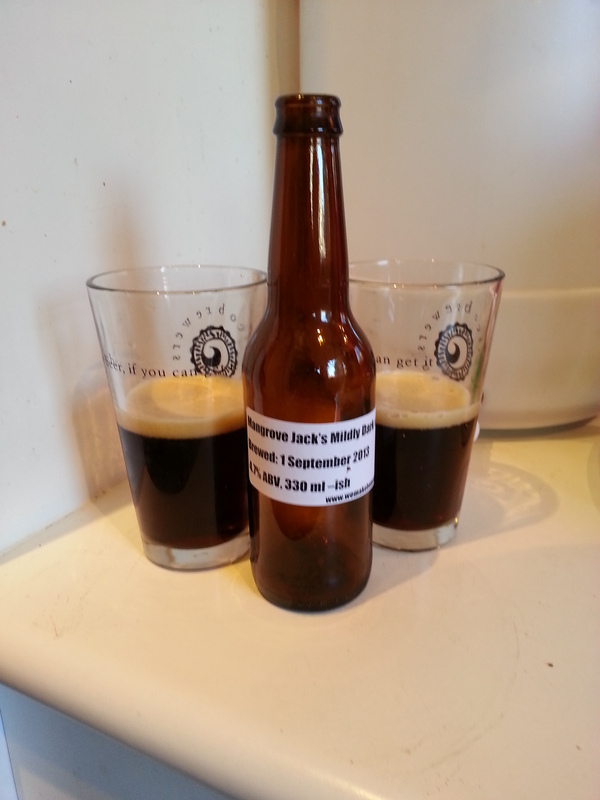 While I was on my holiday, Mikey did a brew of Mangrove Jack’s Mildly Dark all on his own. This was a simple extract kit with a few other things thrown in to make it a dark. Judging from the recipe, Mikey threw a couple extra malts in here, and, if I remember correctly, Mikey mentioned he had trouble getting everything to ferment. Because of this, the beer took a little longer than usual to condition in the bottle as well. We tried it a couple weeks ago and it wasn’t quite ready. We tried it again over the weekend and it was definitely ready. On the colour, it was a good dark brown with a bit of red when held up to the light. Dark, but not murky. 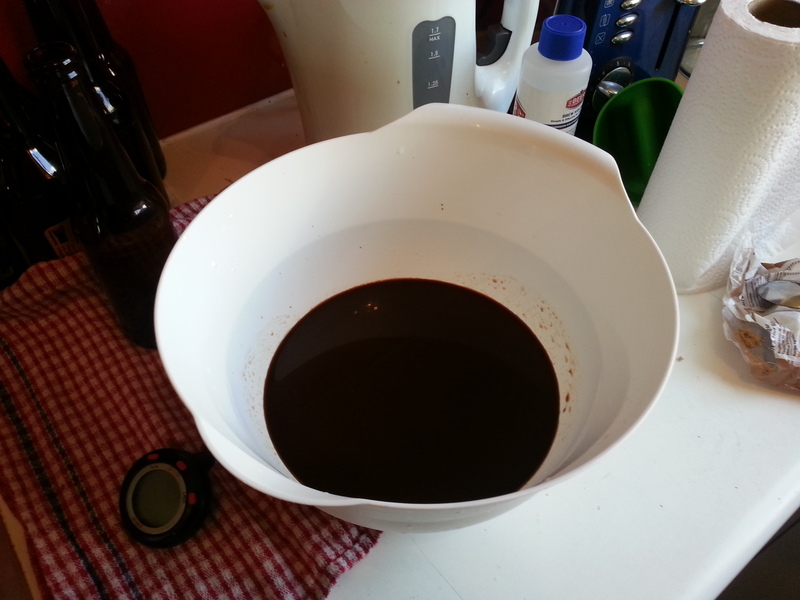 It was almost a brown ale in colour, but I’d consider it over the line to be a “dark” ale. The smell was great and interesting, with quite a bit in there. The main things in there were toffee, citrus, and apple. The interaction of the apple and the citrus was great, and really complimented the toffee smells well. When I really stuck my nose in there, I also was able to find a little bit of chocolate in there too. The taste was great and easy. The beer was quite obviously hopped, but mildly so, with the malt really taking the foreground. Gladly, the apple came through in the taste as well, which interacted with the malt quite well. Mixed in among this was a bit of a licorice taste with a tiny bit of molasses as well. Unfortunately there wasn’t a lot at the end to really round out the flavour, which I would have really liked to see; just something to round everything out. I think if an additional taste hop had been added, a little bit of complexity could have been added in the finish. The kit that Mikey made didn’t call for any additional hopping, but had he added something mild, it would have been welcome. I think this beer would go well with a nice hard cheese. It’s a fairly sweet beer, but not overly so. A hard, but fairly mild cheese would be a great way to accompany this beer. Chas is still overseas, and will be for a couple more weeks. 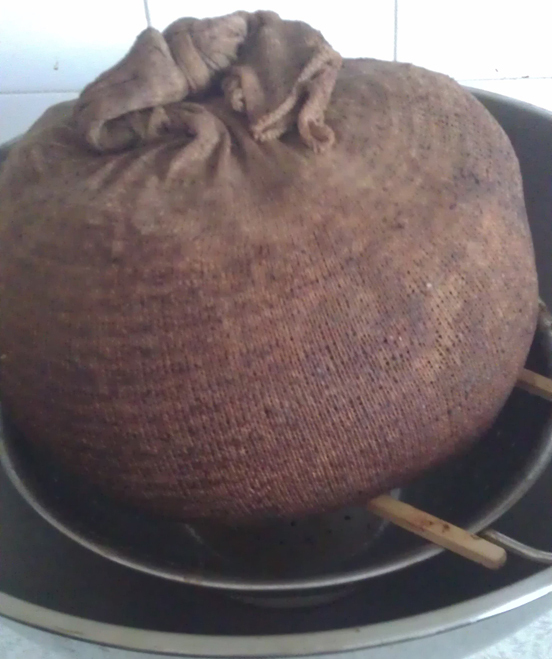 So this week’s brew, and next one in two weeks time, will be sans Chas. Next brew I hope to be joined by Ian, but this week it was just by my lonesome. Like any normal brew day first thing is to bottle the last batch. 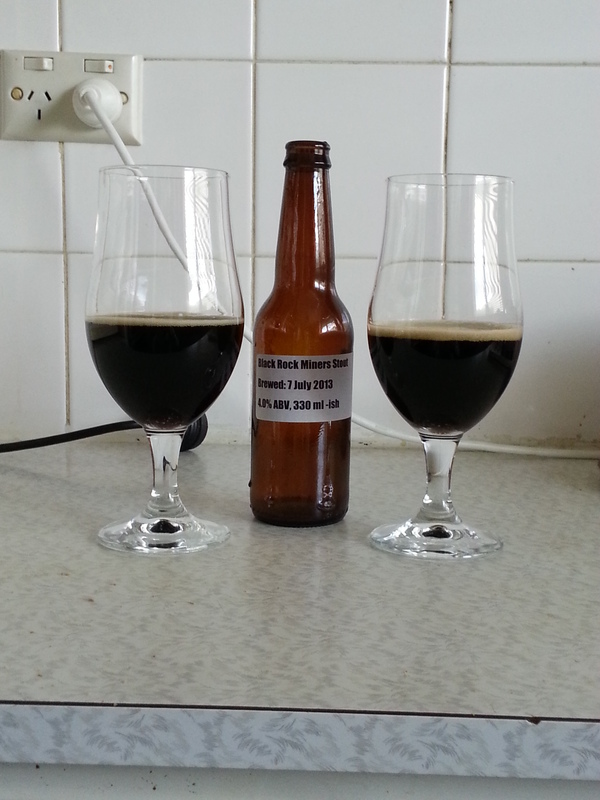 So, most if the 10 litres of Baltic Porter #1 made it’s way into bottles. I say most because, (1) there was a gravity reading sample to be taken, and (2) there was an accident. The little thing that regulates the flow of beer (aka the bottling valve) fell off into one if the bottles as I was filling it. I freaked out a bit, thinking to get as much as possible into bottles before remembering there was a tap! Once things were under control again I reattached the bottling valve and had no more problems. Needless to say I’ve got some bottles that I’m not sure how they’ll condition, and they all marked with a question mark. 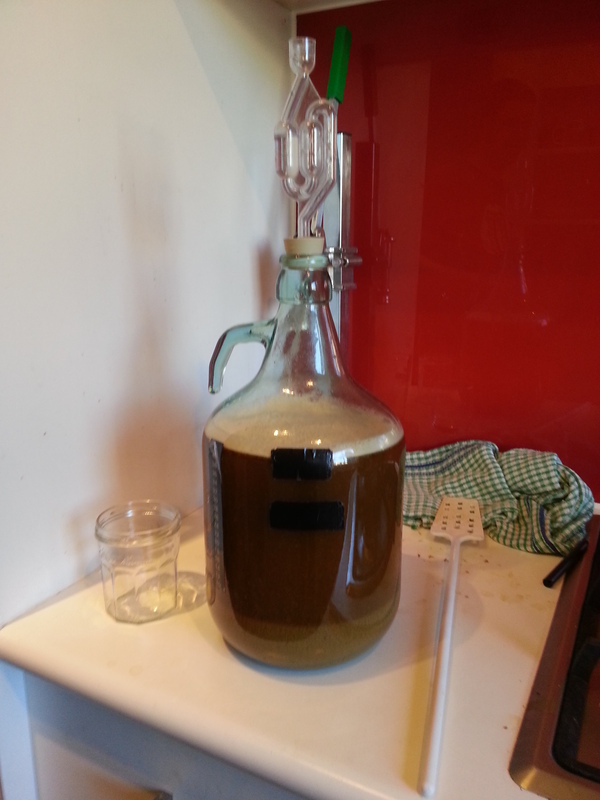 Final gravity came in at 1.021. That means after bottle fermentation it will sit at 7.2%. I’m very happy with that. The Mildly Dark #1 sitting in the fermenter. 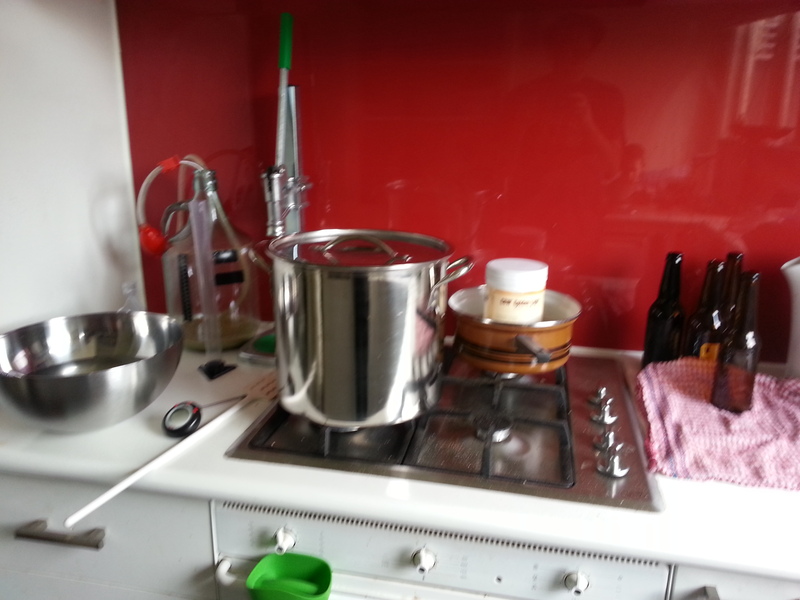 As this was a solo affair, had a sizeable break before brewing. Back a few weeks ago when I picked up the ingredients for the Baltic Porter #1 there were a couple other things I picked up as they were on special. The main thing was the Mangrove Jack’s Mild kit. It’s a liquid malt extract and known for having some decent quality. I also picked up some “factory second” dry malt. 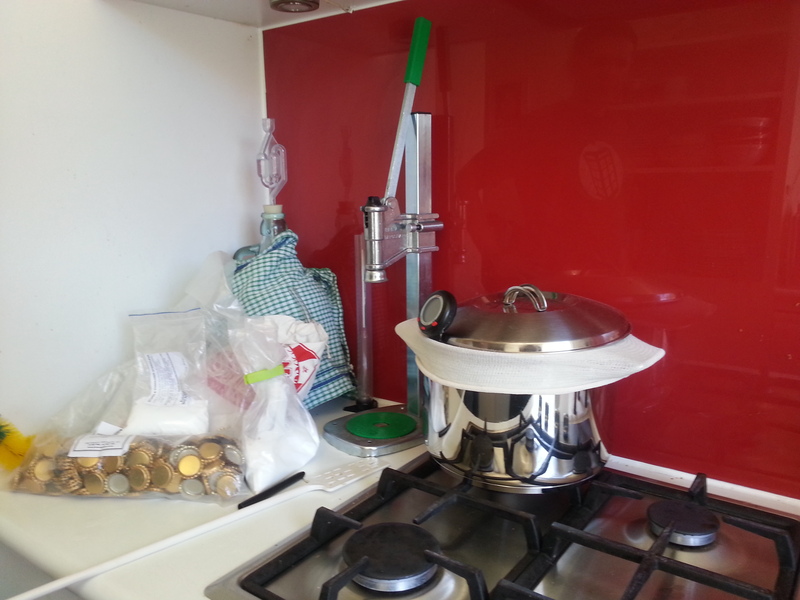 It was recommended to boil up the stuff for use. I just threw it into boiled water, and had a little problem getting it to dissolve. Finally, had a can of dark liquid malt extract that I bought by mistake earlier on. All up this was a kit with a lot of malt additions, both dry and liquid. 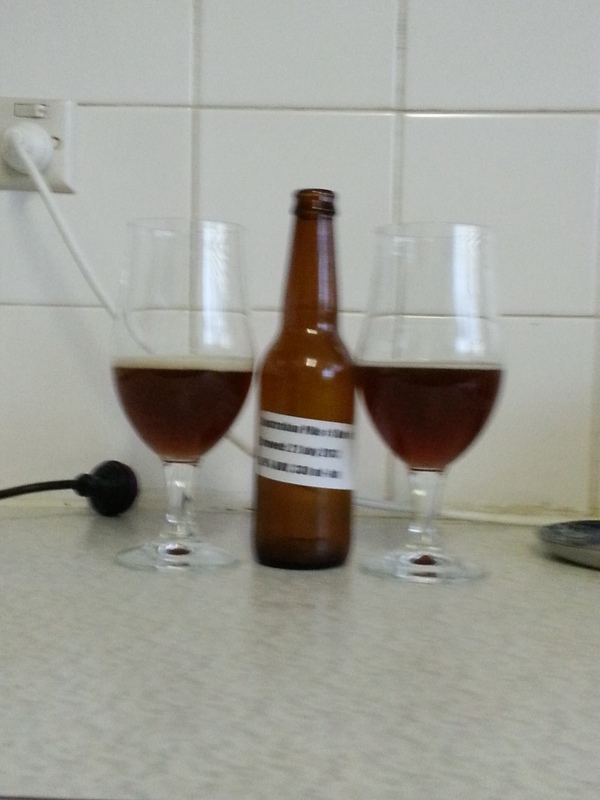 Given the mistakes of the Australian Pale Ale #1 and Australian Amber Ale #1, I’m feeling a lot better about this brew. Given the extra dark malt I’ve dubbed this beer Mildly Dark #1. 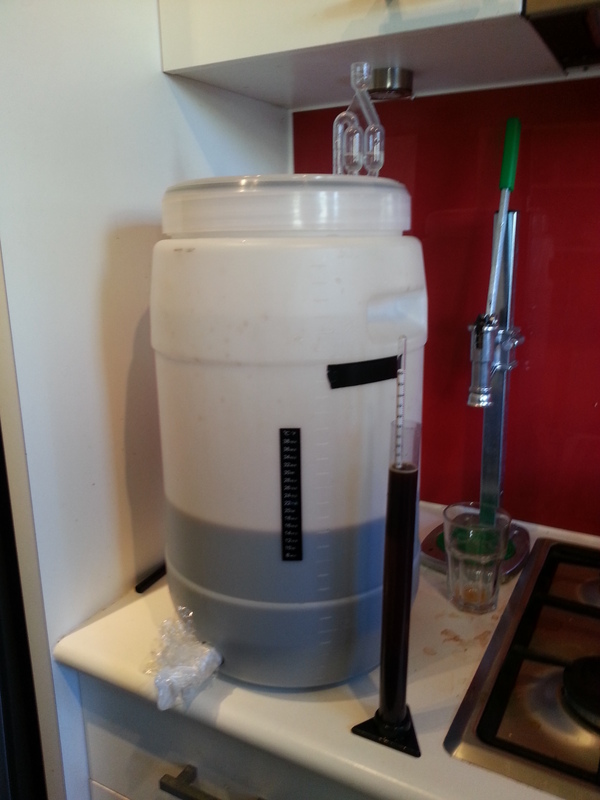 Gravity ended at 1.056. Happy with that. 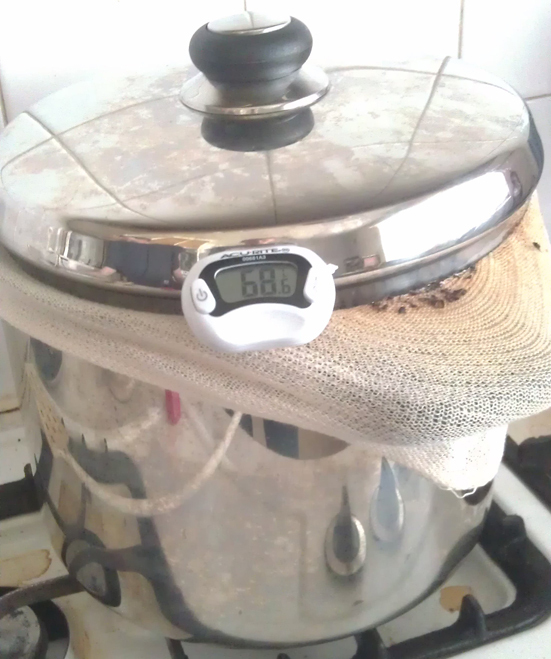 If it ferments down to around 1.020 then the final ABV will come in around 5%, and that’s something to look forward to.